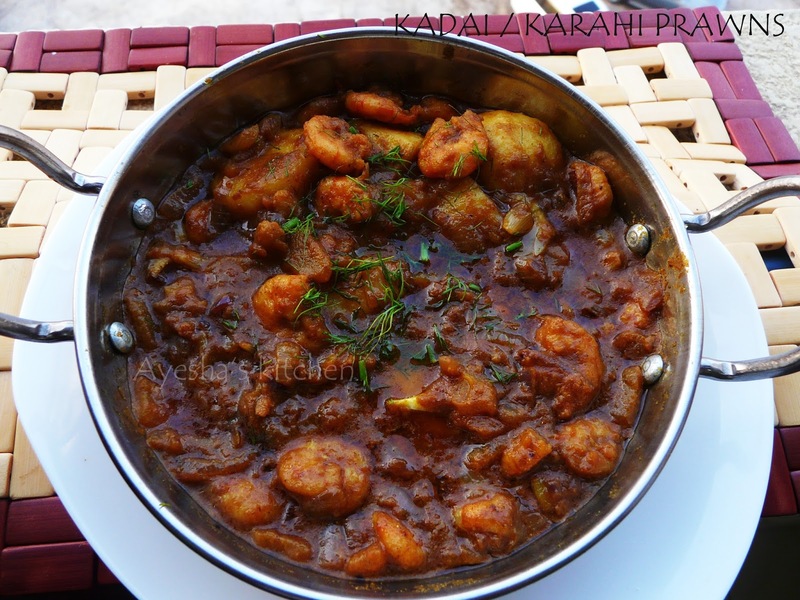 Hi foodies, today we will see how to make delightful, spicy, aromatic and much more..... kadai prawns/shrimp recipe. This dish has a tempting taste that makes us prepare this dish regularly. 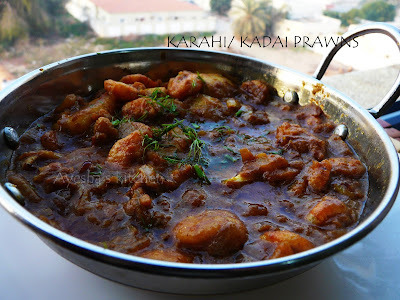 So let us see how to make Kadai prawns/yummy prawns curry/ spicy shrimp roast/ karahi prawns. Do give a try to this simply delicious recipe with prawns/shrimp. Dry roast all these spices in a medium flame till fragrant. Do not burn them. Once it is cooled, grind it to a fine powder. You can make powder in bulk and store it in an airtight container. The above given is the quantity required for this dish only. Boil the peeled and halved baby potato in salt water for 8 minutes or more. Drain the water and keep it aside. In the same oil saute cleaned prawns and boiled baby potatoes for 3 minutes or until it changes its color. When done transfer it to a plate. ( you can add extra oil if required). Now add few tsp of oil in the kadai and saute onion until translucent. Then add ginger, garlic paste and saute until the raw smell disappears. Then add the tomato puree. Saute for a while and cook until the gravy turns dry. When done, add the sauteed prawns and baby potatoes and mix well with the onion mixture. Add salt if required. After two minutes add the sauteed tomato along with coriander powder, turmeric powder, kadai masala powder and salt if required. Add half a cup of water and combine well. Cook until the prawns and potatoes are done or until the oil separates.